HTC added two new smartphones to its lineup today: the HTC U Play and HTC U Ultra. 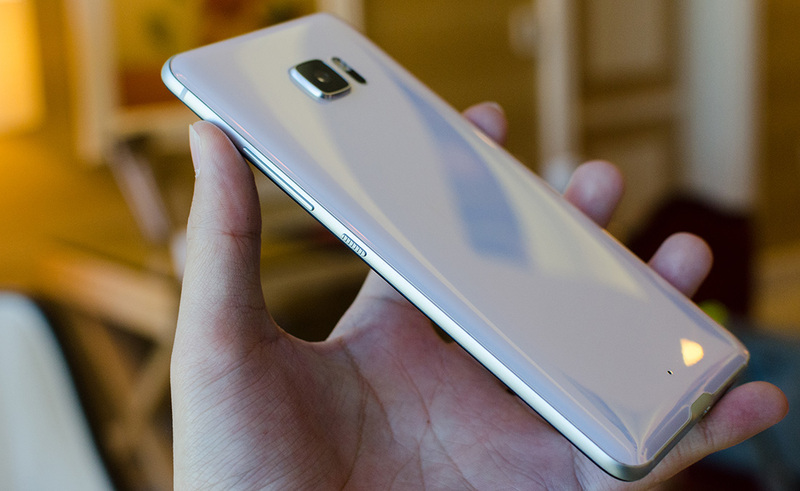 Both phones use an aluminum frame paired with a curved glass back, an unusual choice of materials for HTC, which has a reputation for creating nice-looking, aluminum unibody phones. 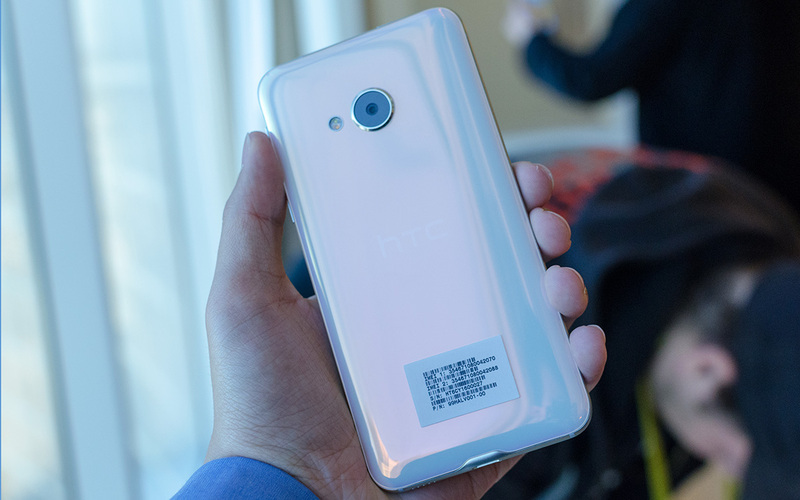 Underneath the rear glass are layers of colored minerals that reflect light in interesting ways and add visual depth, creating what HTC calls a “liquid surface” that gives the phones an iridescent sheen. Each phone comes in four different colors: Brilliant Black, Cosmetic Pink, Ice White, and Sapphire Blue. Both phones have a single-piece volume rocker and highly textured power button on the right edge. There’s also a single downward-firing speaker and a microphone on the bottom edge. Unlike most phones that use a symmetrical pattern of slits to conceal these components, the HTC U phones just use a small circular hole for the microphone. 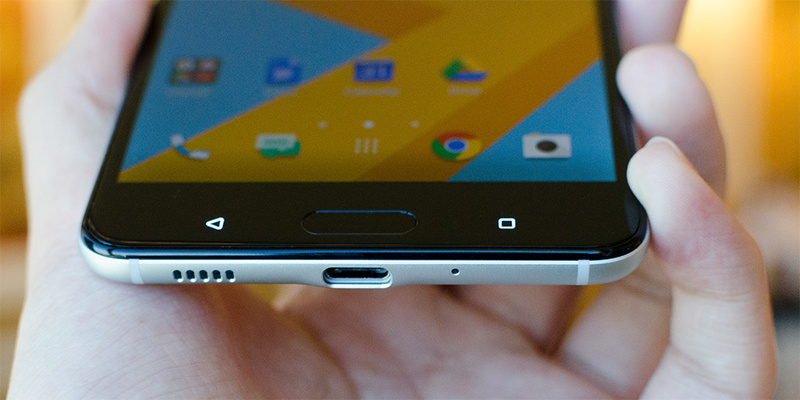 Neither phone includes a 3.5mm headphone jack, instead using the USB Type-C port for audio. The smaller U Play comes with a 5.2-inch 1080p (423PPI) IPS LCD display that’s covered with Gorilla Glass. The more expensive U Ultra includes HTC’s “Dual Display” that combines a larger 5.7-inch 1440p (515PPI) IPS LCD with a secondary 2.0-inch 160x1040 IPS color LCD in the upper bezel, similar to LG’s V20. This secondary screen displays contextual shortcuts to favorite contacts or apps, reminders, and notifications among other things. The HTC U Play has a 16MP rear camera with phase detect autofocus (PDAF) and optical image stabilization (OIS) paired with an f/2.0 lens that has a wide-angle 28mm equivalent focal length. The circular camera module sits proud of the rear glass and has a circular dual-tone LED flash offset to one side. Around front is a 16MP selfie camera that uses an UltraPixel branded sensor with larger pixels to boost low-light performance. It also has an f/2.0 lens and a wide-angle 28mm equivalent focal length that’s useful for squeezing more people into a group shot. Both the front and rear cameras have an automatic HDR mode that improves dynamic range for scenes with dark shadows and bright lights without user intervention. 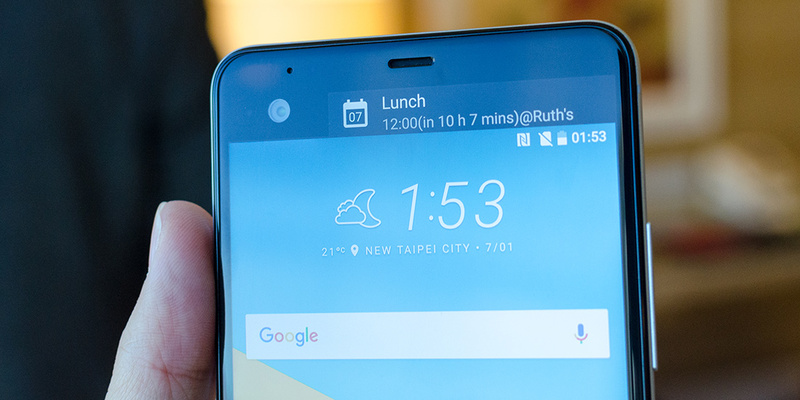 The HTC U Ultra’s front-facing camera is similar to the U Play’s, but the rear camera uses a 12MP sensor with larger 1.55µm pixels. While the specifications are similar to the HTC 10’s rear camera, which generally produces high-quality images and uses the Sony IMX377 Exmor R sensor, the U Ultra is likely using the Sony IMX378 Exmor RS sensor that’s found in Google’s Pixel phones, because it includes an upgraded hybrid autofocus system that combines PDAF with laser AF, which the IMX377 sensor does not support, to improve performance over a broader range of lighting conditions. The U Ultra’s rear camera has OIS to help remove hand shake during long-exposure shots and is paired with a larger aperture f/1.8 lens that should help it capture more light. The U Ultra’s rear camera module is square and sticks out farther than the U Play’s camera, which is likely a consequence of using a lens with a larger aperture. Both phones have a pill-shaped, capacitive-touch fingerprint scanner on the front that doubles as a home button, with capacitive navigation buttons to either side. The fingerprint sensor and buttons are not centered in the lower bezel, however. Instead, they sit very close to the lower edge, making them a little harder to use. While we have not seen inside these phones yet, this design concession is likely to make room for the display/touch controller(s). Other OEMs have found ways to relocate these components to reduce bezel size or make room for navigation buttons, but HTC does not appear to be using those methods here. The U Play’s MediaTek Helio P10 SoC includes eight Cortex-A53 CPUs and a Mali-T860MP2 GPU for limited gaming. The U Ultra steps up to a Snapdragon 821 SoC; however, like Google’s Pixel phones, it uses the same peak CPU frequencies as the lower-clocked Snapdragon 820. It’s a curious design choice, but it should not have a noticeable impact on everyday performance. I would definitely like to see larger batteries in both phones. Inside the U Play’s 3.50-7.99 mm thick chassis is a 2500 mAh battery. For comparison, the smaller 5.0-inch Google Pixel packs a 2770 mAh battery into a 7.3-8.5 mm thick chassis, and the 5.1-inch Samsung Galaxy S7 packs a 3000 mAh battery in its 7.9 mm thick chassis. It’s a similar story for the U Ultra, whose 3000 mAh battery inside a 3.60-7.99 mm thick chassis looks small compared to the 3450 mAh battery in the 0.5 mm thicker but smaller 5.5-inch Pixel XL, or the 3600 mAh battery in the smaller (5.5-inch) and thinner (7.7 mm) Galaxy S7 edge. The U Ultra does include Qualcomm’s Quick Charge 3.0 for rapid charging, while the U Play supports 5V/2A charging. The U Ultra has a few other upgrades over the U Play too. While it’s possible to use voice commands on both phones to answer calls, dismiss alarms, and send messages, for example, only the U Ultra can respond if it’s asleep with the screen locked, a feature likely enabled by Snapdragon 821’s low-power DSP. HTC’s BoomSound feature is also exclusive to the U Ultra, which uses the earpiece on the front of the phone as a tweeter and the downward-firing speaker for lower frequencies. The HTC U Play will be available in select markets around the globe in Q1 2017, for an undisclosed price, with options for either 3GB or 4GB of RAM and 32GB or 64GB of internal storage. 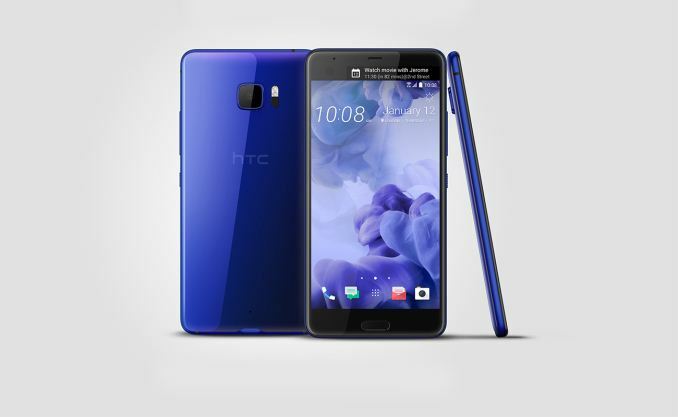 Meanwhile, the HTC U Ultra, which comes with either 64GB of internal storage and Gorilla Glass 5 covering the front or 128GB of storage and harder sapphire glass, is available for pre-order in the US January 12, exclusively at htc.com, starting at $749. It comes unlocked and is compatible with AT&T and T-Mobile networks. HTC U Play's SoC is terrible. And the HTC U Ultra could do with a larger battery. They had better have made the device waterpoof if the battery is non removable (Which I don't think it is waterproof) and added in wireless charging if they go with Glass. I can understand the 1 year old SoC (although barely considering the price). I would get past the "all glass" design since that back would never see the light of day from under a case. But the 3000mAh battery? Add another damn mm to the back, make the camera flush and squeeze in a bigger battery. 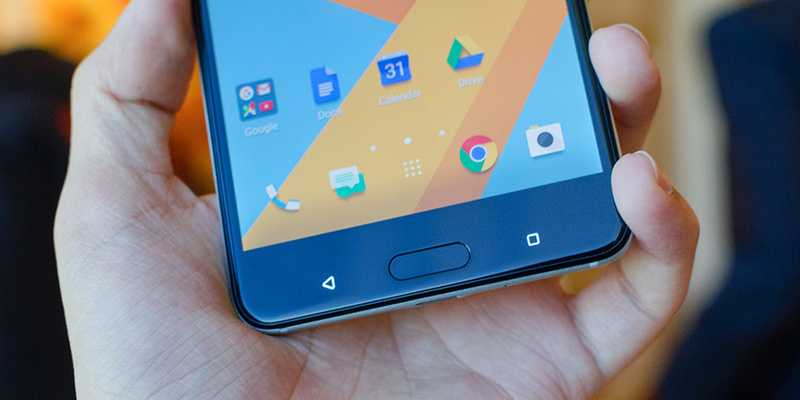 Sign me up to the list of users disliking HTC use of MediaTek SoCs (though at this point they don't do it by choice). He may be like us that are stock android or GTFO.